“How did you get the skin so crispy?” It was the first thing my husband asked me as he started carving the bird. I took this as an indicator that this recipe, although we had not tasted it yet, was going to be a great one. Let me back up a bit. 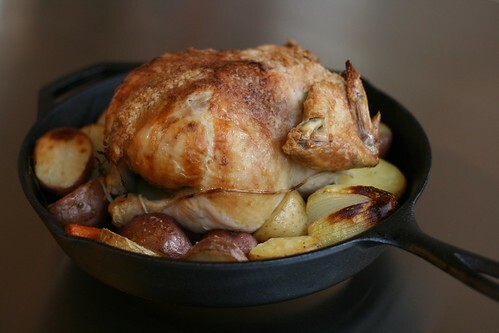 Before I made this, I had only roasted a chicken once before – years ago, when I was just starting to learn to cook. Unfortunately for me, that first chicken had a few scraggly feathers still left on it when I unwrapped it from the grocer’s plastic. Those few chicken feathers immediately conjured up images of happy white-feathered hens clucking around the yard, and that train of thought led me to think of the pet chicken we owned when I was a kid. Dixie was a sweet hen who, in all honesty, thought she was a dog. Her best friend was our dog, Jesse, and she was always at Jesse’s side. 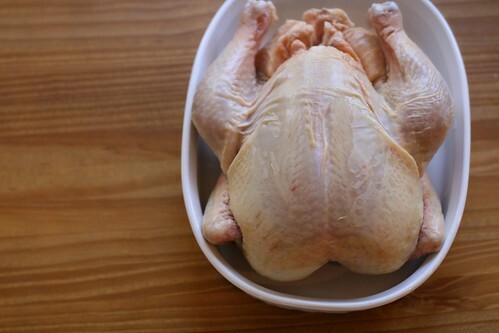 So, those feathers left on that raw chicken made it really difficult for me to roast and cut up the bird. And I certainly did not enjoy one single bite of it. And, because I was acting so squeamish about the whole thing, I’m sure my husband didn’t enjoy it either. He ate it, but I think he was expecting a good case of food poisoning after the experience. But this is a new era for me. 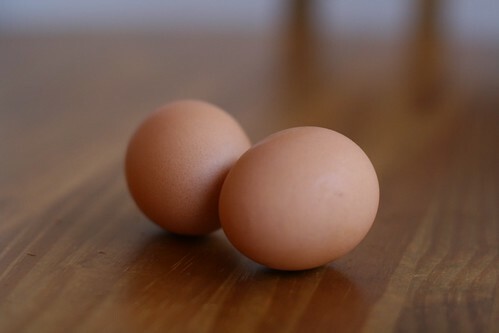 Time – and practice in the kitchen – have helped me become less squeamish about handling raw meats, including chickens with scraggly feathers left on them. So, I decided it was time to roast a chicken again. 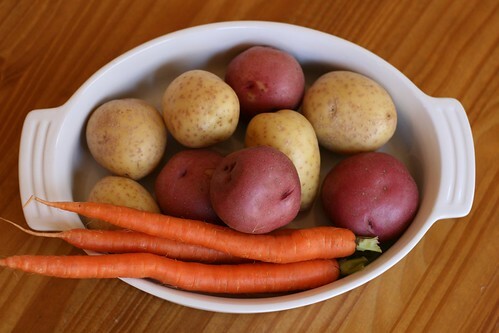 The root vegetables make a bed for the chicken, and the rendering fat and juices from the chicken flavor the vegetables. If you have a big cast-iron skillet, use that. 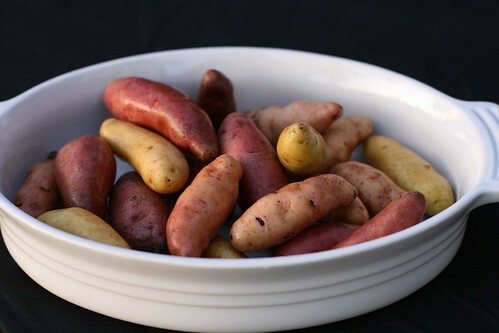 We also often leave it uncovered in the refrigerator for a day or two, which dries the skin and thus helps it to crisp during the roasting. Adam Roberts of The Amateur Gourmet has written a post detailing the recipe from Keller’s book, so I’ll refer you there for the details. I used the vegetables that I had on hand, which did not include the rutabagas, leeks, and turnips that the recipe calls for. 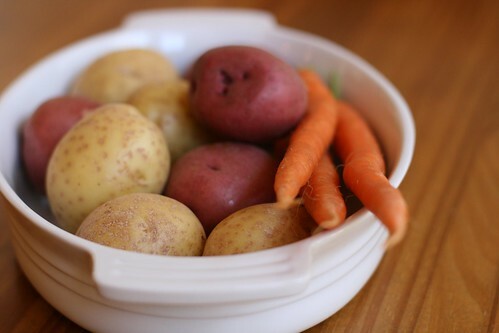 Instead I used some red new potatoes, small Yukon gold potatoes, a yellow onion, and some carrots. I also used the new Lodge cast-iron skillet I purchased about a month ago. And, since I didn’t know that I was going to roast a chicken two days prior to making it, my chicken sat uncovered in the fridge for about six hours. And the chicken? It had intensely flavorful, crispy skin and was moist and tender on the inside. The vegetables were the most flavorful roast vegetables I’ve ever made, thanks to the rendered chicken fat in the skillet. I still need to practice my chicken trussing technique, but that’s simply a cosmetic issue. 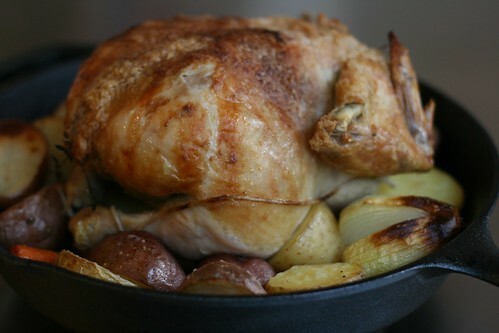 So, thank you, Mr. Keller, for the perfect recipe for reintroducing me to roasting a chicken. I must confess something. Prior to this meal, I have never poached an egg. I have eaten poached eggs, but I have never made them myself. It has been on my to do list for some time. So, today, I poached my first egg. I made the pistou in my mini food processor using some basil leaves, extra virgin olive oil, and garlic. My basil plant died this winter, so I had to buy some for this dish. 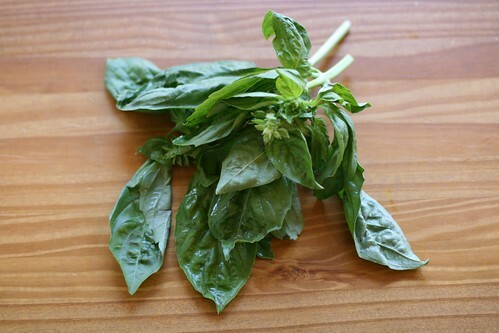 I fully intend to have basil in my new garden. Did I mention I’m going to be starting my first garden? It’s very exciting. 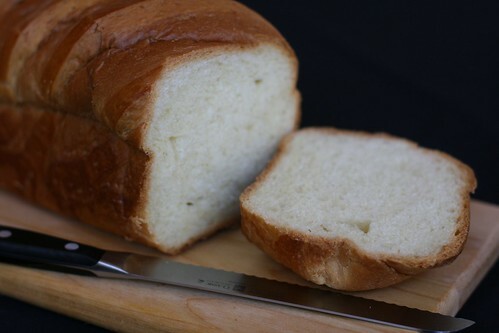 Our local bakery, The Flour Pot, makes a wonderful brioche. I picked up a loaf this morning, and it took all I could do to resist eating it before lunch. I toasted a slice of brioche, shaved some parmesan cheese over the toast, topped it with one poached egg, and then sprinkled the pistou and some fleur de sel over the top. It was fabulous. And gone within about 30 seconds. Poaching an egg is not rocket science, but it’s not the easiest thing either. I’m sure with practice I’ll figure out how to get rid of those trailing strands of egg white. 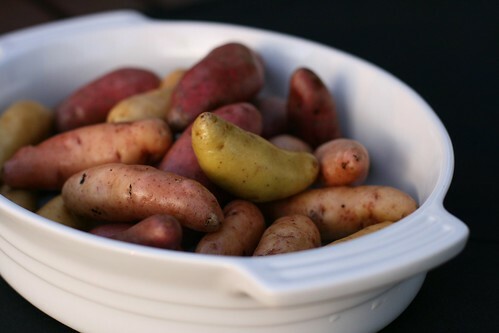 Pistou is a great addition for ramping up flavor. So is fleur de sel. 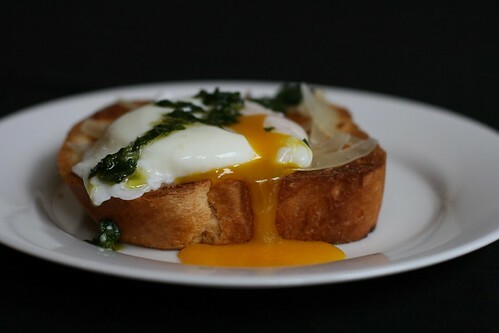 I need a personal photographer to capture some of the more interesting steps of the process – like the egg poaching part. I’m not sure my husband will give up his day job, though. I can’t pay that well. Sometimes I just crave a simple dinner, and Sunday was one of those days. After browsing through cookbooks and my latest food magazines, I just couldn’t get motivated to prep something creative and exciting. The fact that I had caught a cold over the weekend wasn’t helping matters, of course. It’s very hard to imagine cooking something fabulous when you can’t even smell it, you know? With the warm weather we had yesterday – sunshine, low 70s – it seemed the perfect evening to use the grill. 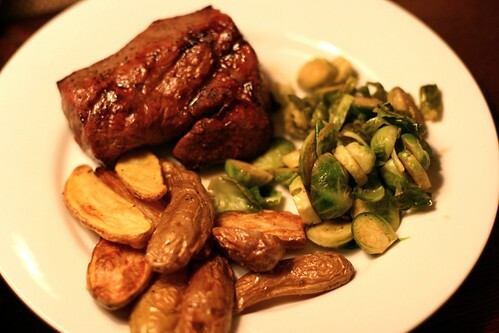 My husband made a quick trip to the grocery, and he came home with two steaks, a bag of Brussels sprouts, and potatoes. The kids ate early, and during their bathtime, I prepped veggies and brought the steaks up to room temperature. The steaks were seasoned with olive oil, Kosher salt and fresh ground pepper and then grilled to about medium. 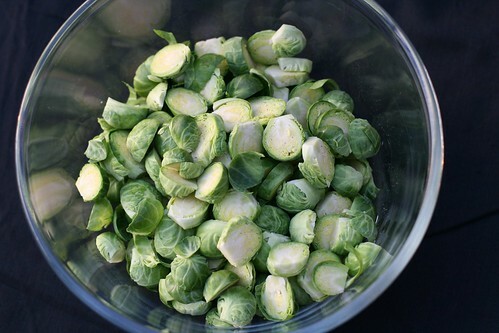 While the fingerling potatoes roasted in the oven, I sauteed the Brussels sprouts in olive oil and seasoned them with Kosher salt and a dash of balsamic vinegar at the end. Served with an easy-drinking glass of 2005 Marietta cabernet sauvignon, it was a perfect simple Sunday dinner. ©2019 The Merry Gourmet. Design by Purr.